Confused about Labels in the U.S.? You should be! 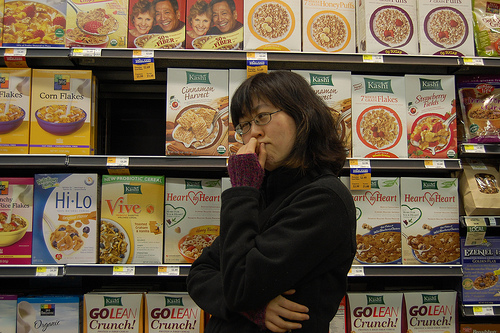 A Look Down the Cereal and Granola Aisle Companies’ Marketing Techniques Intentionally Blur Line Between Natural and Organic some companies that started out organic, and built consumer loyalty as organic brands, have switched to non-organic “natural” ingredients and labeling. Peace cereal® is an example. Companies that market “natural” foods to eco-conscious and health-conscious consumers benefit from widespread confusion between organic and “natural.” This section details various techniques that have been used by companies in their attempt to appear to be equivalent to organics, intentionally blurring the distinction to mislead shoppers. Companies marketing “natural” products merely pay lip service to sustainability and eco-friendliness, while undercutting truly committed organic companies. cereal boxes. Most egregiously, it did not change the barcode on the cereal boxes. Many retailers and shoppers were unaware of the switch until e Cornucopia Institute conducted an investigation in late 2010. Linda describes what good organic corn looks, feels and tastes like. Your Food Supply #4: Healthy Lard? Good Lard, What is it and Why Should I Care? Your Food Supply #1.2: You’re Kidding, Right? Do you know how many different cows are in one hamburger? Question #1: When you are eating a hamburger, you’re not eating beef from one cow, you’re eating a beef mixture from how many cows? Let us know your answer and we’ll tell you after we get 20 responses. Question #2: Why do you think there is a hedgerow of trees along the feedlot bordering the highway?